If you are suffering from a kale overload (production can get a little out of hand even in a home garden this time of year) and have run out of inspiration for ways to cook it, here is another option that you might want to try. Lightly cooking the kale with wonderful savory ingredients that you most likely have in your cupboard or fridge right now is great, but adding that mixture to labneh takes these ingredients to a whole new level. First off: Labneh is a thickened yogurt or yogurt cheese typically found throughout the Middle East. It’s pretty readily available these days, but if you are having a hard time finding it you can make it by simply straining thick, full fat Greek cow, sheep or goat milk yogurt in cheesecloth over a bowl for a day or so until enough liquid has drained out that it has more of a cream cheese consistancy. In fact you can even buy purpose made yogurt strainers online if you think you will be doing this often. Personally I like the flavor of the sheep milk labneh, but no matter what kind, these days I often prefer it over Greek-style yogurt in cooking as it adds another dimension to dips, sauces, marinades or even baked goods. In fact, I have been known to add it to tuna fish salad..
You will be giving this dish and instant umami boost by sautéing anchovies, capers and garlic first along with chili flakes and then adding the chopped kale to this mixture (I took my inspiration from a Melissa Clark recipe) but that to me, though tasty, was in need of a something cooling and creamy. That’s where the next player comes in.. enter labneh. Once you have that delicious savory kale mixture ready, add some citrus juice, chopped nuts, chopped fresh herbs and fold into the labneh. It’s instantly transformed into a fresh yet rich dip or side dish that works well with anything grilled, or even on top of a baked potato. 6-8 anchovies - Use the good ones, usually Italian in a glass jar. It makes a huge difference! 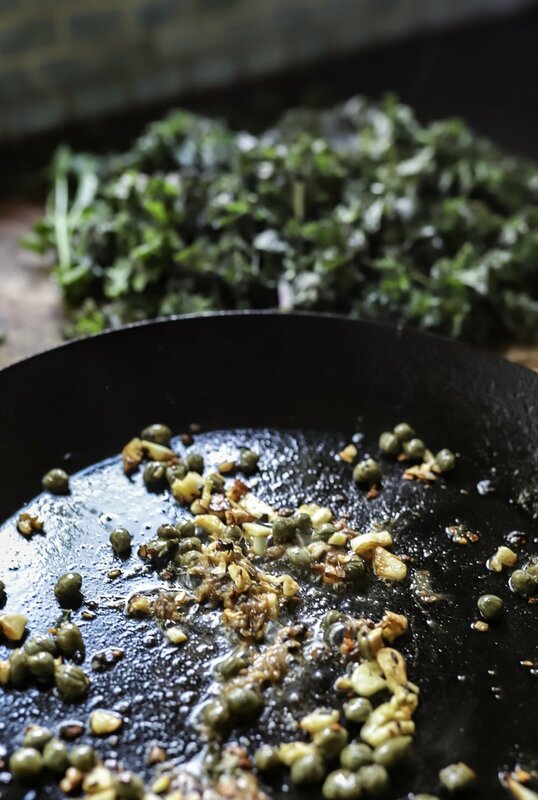 -Add a couple of tablespoons of olive oil to a preheated sauté pan. -Gently sauté the garlic, anchovies and capers and some until they are lightly golden brown - the anchovy will kind of disappear, which is fine. -Put the labneh in a mixing bowl and after the cooked mixture cools a bit, add it to the labneh and mix well. Check for salt again and add to taste. Transfer the finished mixture to a serving dish and top with lots of chopped parsely and a drizzle of really good olive oil too, if you like. 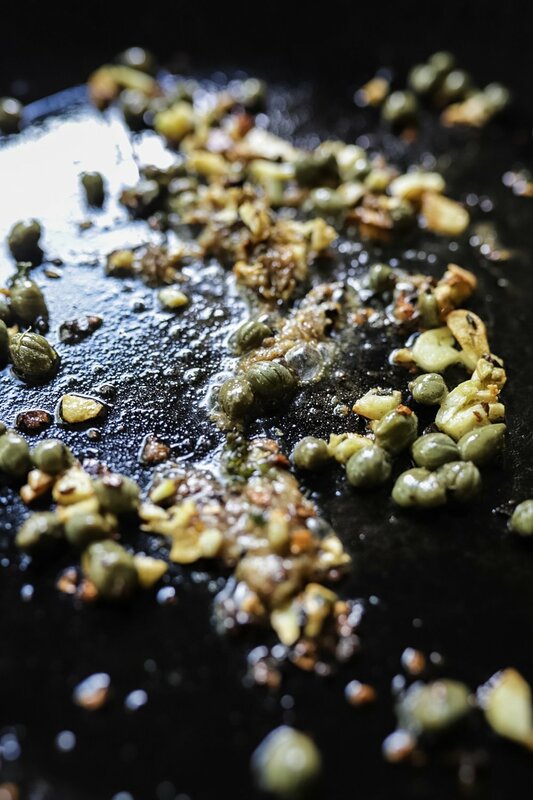 Sauté capers, garlic & anchovies no darker than this please!